Our Dad’s strength and devotion in faith, family, love and charity was unwavering and he shared those convictions with us. He strived to be a teacher and roll model to us all, much like his Father and Mother were to him. His message to us was consistent; practice your faith, take care of your loved ones, be charitable and give thanks to the Lord. He taught and practiced this throughout his life. We loved and respected him for it. For our Dad, his faith and love of family was born from his upbringing on 1514 Sanford Street, Muskegon Michigan. In 1999 he wrote the following, “By God’s grace, I was given the special privilege of being born into this family”. The Valliere family was very large by today’s standard, twelve children and he was the next to youngest. Not the most enviable position in the pecking order. But it was his mother, Edwidge (Memere), who instilled in him and all the siblings a strong moral belief and devotion to our Catholic faith. He reflected on this years later when he lovingly wrote “this benevolent dictatorship in serious matters, allowed each child to grow up without the need for questioning the moral beliefs that guided the family life. As such, the children grew up with solid moral underpinning. This was the “keel” that kept each of us on track as we grew into adulthood. No need to question ourselves as to “who we were?” or “where we are going?”. All his brothers and sisters shared in this belief and revered their mother for this gift. Dad valued this immensely and wanted the same for our family and others he counseled. After his genealogy research and travels to learn more about our ancestors in the 90’s, he wrote “it is comforting to know that this has been our faith through the centuries and doubly comforting to accept the Church’s teaching of the resurrection, when the last and final Valliere reunion takes place. A reunion that will not end with the setting of the sun, but will continue forever”. Anybody and everybody who has meet our Dad knows how witty, humorous and what a great story teller he was. He enjoyed telling ghost stories, especially to children. He was very animated when he read, always leaving the children wanting more. On the weekends when we were young, he enjoyed watching scary movies with us and would often recite the line “Who knows what evil lurks in the hearts of men? The Shadow knows…. followed by a blood curdling laugh”. When he caught us fooling around late at night, he offered up this advice “it won’t be so funny in the morning”! As much as he could scare you, he was even greater at making you laugh. Sometimes it was a story, other times a simple remark or gesture. One evening, back in Virginia when we lived in a townhouse, we were visited by an irate neighbor that was not happy with our Irish setter’s bathroom behavior. Apparently, our dog “Big Red” got out of the house a lot and left calling cards on the sidewalk. The neighbor knocked on the door and departed immediately leaving a goody bag full of you know what. Needless-to-say, our Dad was none to happy. In honor of this visit, he promptly renamed the dog “Crapper” and for several nights thereafter you could hear him calling his name from the open front door, “here Crapper, here Crapper”. Dad was frugal and not shy to admit it. When describing Valliere characteristics he noted “besides our complexions and loud voices, we have an inclination to be overly frugal at all times and under all circumstances”. Mark recalls vividly his two-week genealogy trip with Dad through Canada searching for our ancestor’s history in 2000. “We stayed at the cheapest hotels we could find regardless of safety. Late one evening, we pulled over at a roadside motel and we went in to check on room availability. The clerk informed us there was no vacancy. My Dad inquired about the hotel next door, which we noticed when we pulled in was completely vacant, dark with no cars in front. The clerk told us that hotel was scheduled to be demolished and most of the rooms had been stripped of their furniture. My Dad asked if the lights still worked, the Clerk responded yes and that evening we spent the night in an abandoned hotel scheduled to be demolished on bare mattresses. We laughed all night in anticipation of being awaken the next morning with the wrecking ball”! 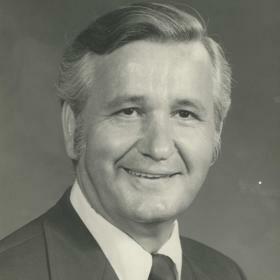 Our Dad was also generous throughout his life, both in monetary and spiritual ways, devoting much time to the church as a member of the Knights of Columbus. Not long after graduating from college, he took a demanding architectural job in Venezuela overseeing the design and development of a new town for 5,000 Americans. Even with these responsibilities, he found time to head the St. Thomas Guild, was editor of the Parish Bulletin, and catechism instructor. In addition, he painted the “Baptism of Jesus by John the Baptist” on the sanctuary wall of the first church he designed. He labored on it for a year and the result would have made his Father proud. His talents also included acting in the Little Theater group, starring in “Born Yesterday”, a favorite of our mother’s. Not bad for a twenty-seven-year-old. His generosity comes from his mother, who in his recollections recalled “my mother was always at the stove as there were so many hungry mouths to feed. Invariably she would not eat herself until long after the last child was filled. She focused on others, always placing herself last. I’m sure that in the heavenly banquet promised to all of us, that my mother occupies a prominent place, “for the last shall be first”. The love my Dad had for our mother was inspiring and everlasting. Up to the last days of his life, they could be found praying together for other’s wellbeing. The love and caring he found with Mom reinforced the strength and beliefs in himself and others. On his accomplishment in life, he wrote “It is extremely satisfying to have designed many buildings and know many of them will survive beyond my own lifetime. They are however, in the final analysis mere bricks and mortar with a finite life. No, I view my real accomplishment as having had seven wonderful children with Joan. These children, a gift from God, and their offspring will indeed survive down through the decades, and multiply, and multiply again. One day they will gather around the throne of God, together with Mamma, Dad, Nanette, Edward, Gerard, Edmund, Wilfred, Louis, Leroy, Beatrice, Genevieve, Robert, together with their husbands, wives, children, our descendants and ancestors. God willing, Joan and I will join them in an everlasting embrace of love”. Dad’s final message to us: “Please remember me in your prayers, thank you for your love. Take care of you mother. I am very proud of all of you and I love you all very much. Please forgive my many transgressions as a Father and Husband. I look forward to being re-united with you, Joan and all the family in the next world as promised to us by Christ. I ask that you all remain faithful to Christ and his church. Thank you, Joan, for all your love, loyalty and the seven children. Living with me was not the easiest thing. I will be with you again soon and there will be no tears – only joy. I must confess that I am kind of anxious to meet all those ancestors of ours that I wrote about. I want to see whether I got the facts of their lives straight? Pierre Valliere (our first ancestor in the new world) is of interest. Did he work in that stone quarry (Beauport) or not? Mark and I joked about that. What about Prudent “Dion”? Where was he really born”? In the end, Dad bore his cross with humility, grace, patience and never, never complained! He ran the race admirably, trusting in God's promise of eternal salvation. Although death stilled his heart, the memory of his life and religious fervor remains with all of us who were blessed with his friendship and love. Well done good and faithful servant! Thank you, Dad, for the gift of Faith, Family, Love and Charity. 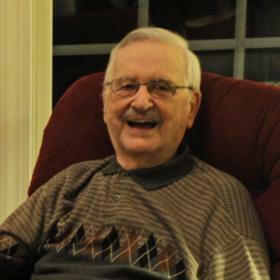 Paul James Valliere passed away September 22, 2018 in his home in Reston, Virginia. Paul was born December 31, 1924 to Arthur Joseph and Edwidge Mary Valliere in Mercy Hospital, Muskegon, Michigan. He was baptized in St. Jean Baptiste Catholic Church in Muskegon. Paul graduated from St. 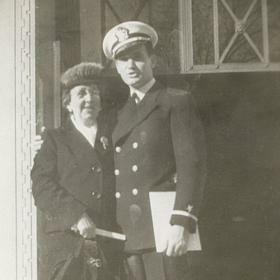 Jeans Catholic School in June of 1943 and entered the Navy, training as a Mechanical Engineer. He served in the Navy as a Commissioned Officer and was discharged from the Navy in September 1946. 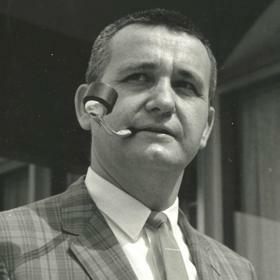 Paul was a graduate of the University of Michigan with a degree in Architecture in August 1949. 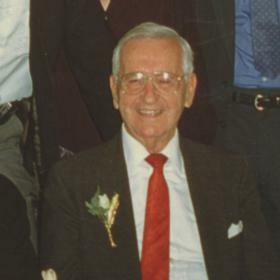 He married Joan E. Kolkowski on October 24, 1953 at St. Jean Baptiste Catholic Church. Paul worked as an architect throughout his career and retired in Reston, Virginia in 1987. He is survived by his wife Joan E. Valliere and his seven children: Paula M. Stewart, Arthur J. (Erin) Valliere, James S. (Janette) Valliere, Matthew D. (Judy) Valliere, Mark T. (Jenny) Valliere, Pamela A. (John) Tomaszewski, and Lisa L. Valliere. Paul is survived by twenty-two grandchildren and 12 great grandchildren. He also is survived by a sister, Rose Marie Mikesell, who lives in Muskegon, MI. Paul was preceded in death by seven brothers and three sisters. Mass will be Saturday September 29, 2018 at 11:00 am at St. Michaels Catholic Church in Muskegon. A Memorial Mass will be held at a future date at St. John Newman Catholic Church, Reston, VA.
Visitation will be on Friday September 28, 2018 from 5:00 to 7:00 pm with a Rosary Service at 6:30 pm at Clock Funeral Home-Muskegon. MEMORIAL: In lieu of flowers, please consider a donation to one of Paul's favorite organizations such as; Priests for Life, Catholic League, or Food For The Poor.